I gather you don't have any interest in the cutlist plugin that already works with metric units, then? Yeah checkout http://lumberjocks.com/daltxguy/blog/5143 to get Cutlist. There's a good amount of documentation and a solid code base to work off of if you're so inclined. First of all, thanks for a great plugin, I have used it a lot in my technical product development of furniture's. 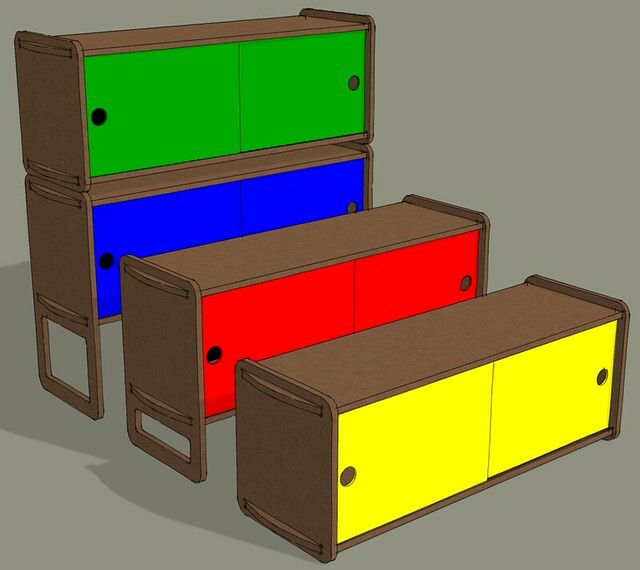 Our department are the part of the company that prepare every furniture detail (product description) for the production. For this we use sketchup and the cutlist plugin. We many times have base materials like 18mm particle board, then some surfaces have veneer on them and some melamine, on top of that we have some kind of surface treatment. Would it be possible to add this "surface treatment" function so that cut list could list that too in the exported csv file??? In some way we need to make it possible to assign a surface treatment to a surface or material. I really hope that some one could help me with this as then we could do all material / treatment assignment in sketchup and finally export it to a CSV file. @ClausGS, is this the sort of thing you're after? I use cutlist today, but i would like to have more options / function. I have attached a pic of what I would like to have from cutlist when i export to a csv file. I would like to have a function where i can assign surface material and surface treatment to each individual surface of a component. In this way it could be in some way exported to the CSV file. Also I want to assign a base material of the component fx, PB, MDF, solid wood ect. All this info will give me a m2 of different surface materials and treatments, for cost calculation. It will also clearly tell the production department the requirements for each single part and it's surfaces. Is this posible to do in some way in sketchup in combination with cutlist??? Hmmmm...... Some Ruby wizard might be able to do something for you. The Cut List plugin only reads one material and in a test I ran it read the second material applied to a face. The first and third materials weren't listed. SketchUp's Report Generator doesn't seem to list the material at all unless it is applied to the component instead of the faces. I don't know if multiple materials could be read from the faces. Could you code the finish schedule in the component's description? You could then import the CSV and parse out the code to fill in the columns. Off the bat, I'd say Dave's point about adding it to the description could work. I tried to follow the discussion. But I notice a different need. 5) export to dxf and csv. Things like finshing and edges are nice but it is a cut list. So a list what to cut. Export to dxf maybe hady when you have acces to a cnc or a laser cutting machine. If you want a list of all the materials, finish of all the faces etc. , in my opinion, you are talking about a material list. The other Cut List plugin won't export DXF files but it will do SVG files which could be converted. It'll handle metric units and to a degree allow you to specify sheet sizes. Thickness for sheet materials is driven by the thickness of the components in your model. In fact : yes I did. No free input of non standard or national / local wood dimensions. It works well I must admit but I miss the "universality". I build bunk beds out of the available stock my wood wholesaler has. He has beams and battens with the desired measurements in certain lengths, certain wooden panels in specific measurements, and certain floorboards. After I have completed a construction with sketch up I would love to just generate an automated shopping list, which tells me how many beams of that length I have to buy, how many floorboards and so on. For that, the plugin must allow me to put in the specific stock my wood wholesaler has. Best would be if I could as well assign prices. That way it could show me as well how expensive the construction will be. And I should be able to save the List of specific stock somehow, so I don't have to punch it in again for each new construction. It helps to see a list of needed Material. You could export a CSV file from the cutList plugin and open it in a spreadsheet application in which you add the maths required to calculate the number of pieces you'll need to buy and the cost. It seems to me that this route would give you the best options for customizing the results. Properly measure the object diagonally. Measuring objects in centimeters or meters. I need to know in which layer each object is located. If it were possible to select which fields of information the list would be exported would be great. The author of the plugin has stated he doesn't have time to make any changes but he's stated, above, that the project is hosted on github. Perhaps you can find someone to hire to make the changes/additions you'd like to have. I can't get the Materials column to list any names. I made a sheet of 4'x8' plywood, then turned it into a component and named it Ply, then I added a material called "Plywood" but it doesn't print in Cutlister it just says N/A. The other columns work fine. I think you're referring to a different plugin, Mike. Would you share your SKP file with me? Send it by PM if you wish and I'll take a look. Dave R wrote: I think you're referring to a different plugin, Mike. Thanks Dave I got it working, great tool. So what did you change? Dave R wrote: So what did you change?